MANILA, Philippines - 'Bagyong Nina' (international name: Nock-ten) has maintained its strength and continues to move in a west northwest direction, weather bureau PAGASA announced in its 5:00 p.m. update on Friday, December 23, 2016. 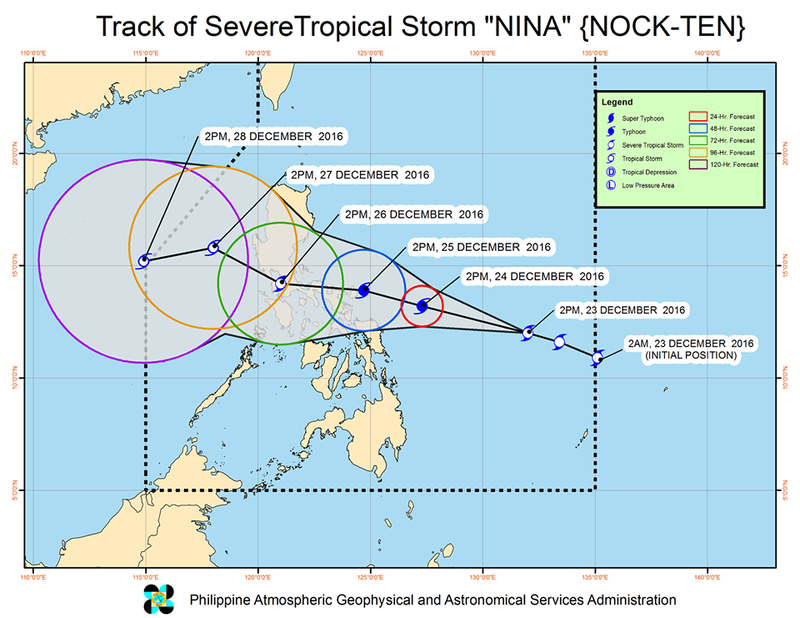 At 4:00 p.m. today, the center of Severe Tropical Storm "Nina" was estimated based on all available data at 700 km East of Borongan City, Eastern Samar (12.2°N, 131.8°E). 'Nina' has maximum sustained winds of up to 105 kph near the center and gustiness of up to 130 kph. It is forecast to move West Northwest at 20 kph. Tropical cyclone warning signal (TCWS) Signal No. 1 (30-60 kph expected in 36 hours) was raised over the areas of Catanduanes, Sorsogon, Northern Samar and Eastern Samar. Estimated rainfall amount is from moderate to heavy rains within its 400 km diameter of the severe tropical storm. Wave height at open sea is expected within 1.25-4.0 meters. 'Bagyong Nina' is expected to intensify further before making landfall over Catanduanes by Sunday (December 25) afternoon or evening. Sea travel is risky over the Seaboards of Northern Luzon, PAGASA said.